Right this very minute Maria is at the bottom of the stairs playing a rollicking game of Apples to Apples. Have you played? Do you like to laugh? Do you like to be fiercely competitive for about forty-two seconds? Do you like to defend your point of view, however absurd? This may be your game. It's our game for sure. Max still takes great pride in the fact that he taught us how to play. I still think of the great game we played in Wisconsin, when we laughed ourselves silly. Two apples... These fresh picked apples came from two of our apple trees. Our first harvest! We sampled both varieties, and I think we agree for fresh eating the Dorsett Golden was our favorite. The more plentiful fruit came from the Anna, and those were baked last night. Apple crisp, anyone? 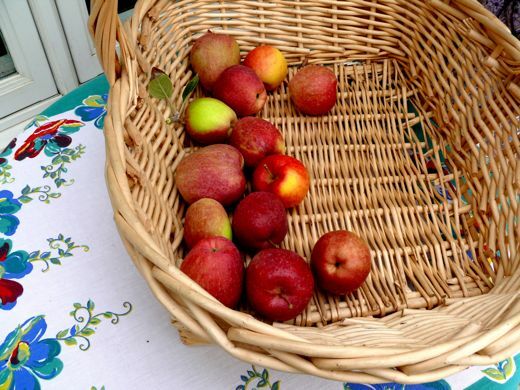 Now that we've enjoyed our apples, we would like the sun to shine, so that the rest of our garden can flourish. Around here people will be talking about this cloudy, drizzly, cold, and unseasonable July for years and years... it's truly exceptional. My daughter loves that game, and she's 15--all ages can play, that's part of the fun, right? HOW do you have apples already!!???!! Ours are still hard little green things, but the crabapples are about ripe. Jelly, anyone?? I haven't heard of Apples to Apples...but I'll bet it's fun playing with your family. 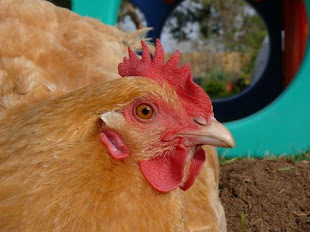 Did you say apple crisp? YUM! Is there anything sweeter than your own apples? Gorgeous. What lovely looking apples! It will be another 6-8 weeks until the first of ours are ready to eat. Last year we had a bumper crop from two old trees, but this year it looks like we'll have maybe a third of that. Oh well - it just means we'll appreciate them more. It always amazes me how many varieties of apples there are! I would love some apple crisp - send some right over please! :) We don't have Apples to Apples... I think we should get it - we may have to wait until Anderson can read though, otherwise he'll feel left out! 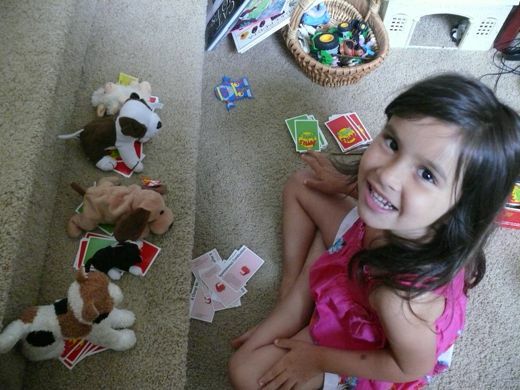 We love Apples to Apples, although we have to find others to play it with since it's not a game for 3.... Lovely to see all the things happening in your house and yard -- viva la summertime! 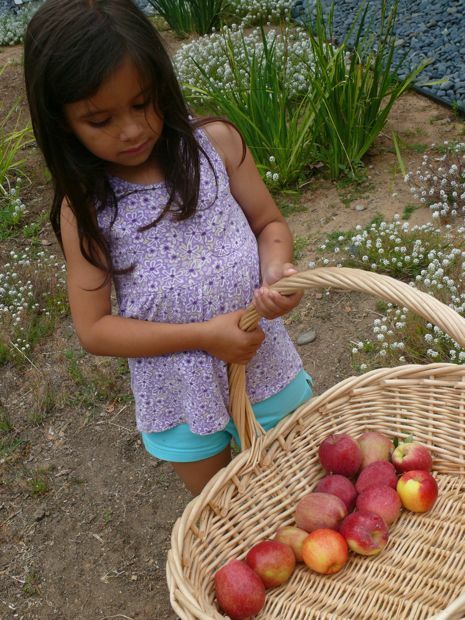 How wonderful it must be to pick apples from your very own trees! Yes please, on the crisp! 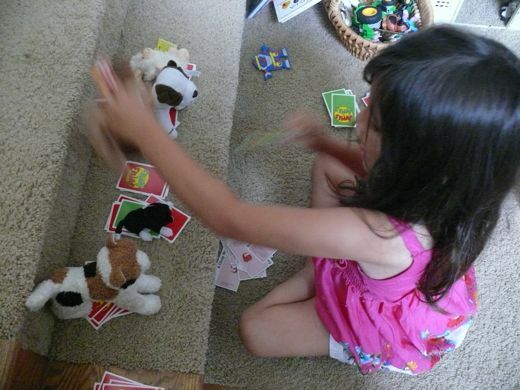 Maria, you are such a doll, sitting there playing on the stairs! oh yes, we are familiar with Apples to Apples. Great game. I haven't heard of Apples to Apples before. Might be fun to try in the classroom someday. And your apples do look good! Yummy! Apples to Apples is one of my favorite party games!